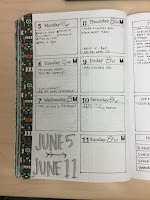 I featured this layout in my June Monthly Layout Blog post. Nicola Davis writes about science, technology and health for the Guardian and Observer and was commissioning editor for Observer Tech Monthly. 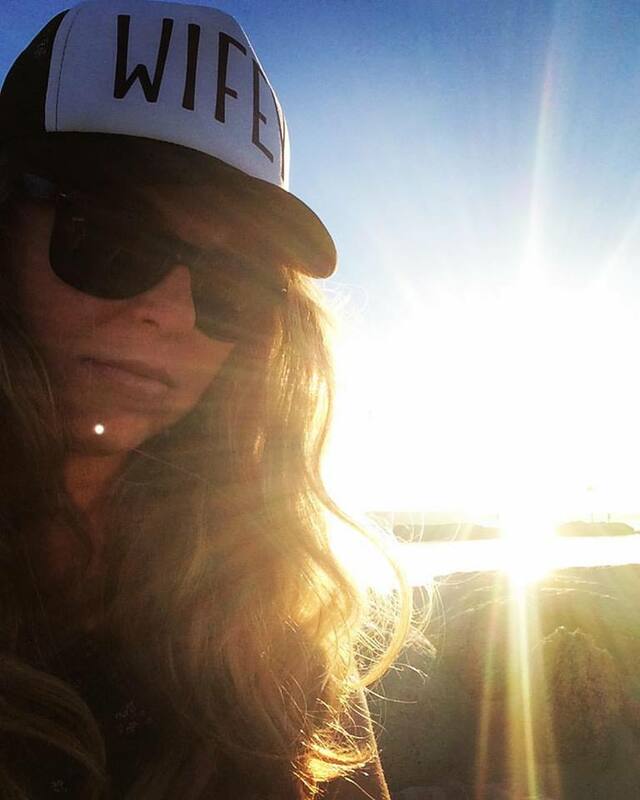 Previously she worked for the Times and other publications. She has a MChem and DPhil in Organic Chemistry from the University of Oxford. Nicola also presents the Science Weekly podcast. 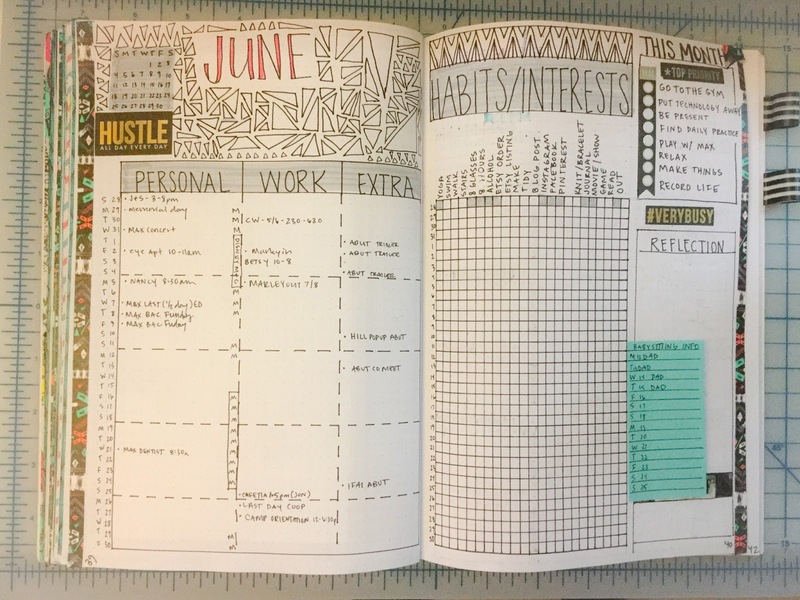 Practicing the Bullet Journal System has really made a difference in my mental wellness. I am usually very busy, my motto: "I only need 18 more hours today.... but no one else can have them...."
Having a Layout selected for a Blog is an awesome reminder that I do good things and spending a little time working though my lists is good for me. So, check back next week for a new Awesome Layout! This week has already proven to be super busy... but very productive. 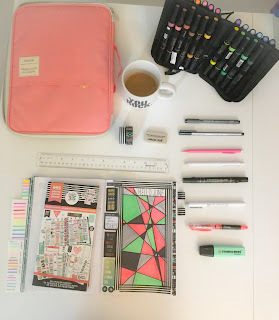 I've been working on a side project for A Broken Umbrella and lots of hours have been spent getting things ready over the past few weeks... and will continue for the next few months. 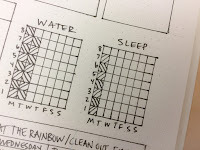 Which meant that this week I had to create a super quick and simple Weekly Layout. 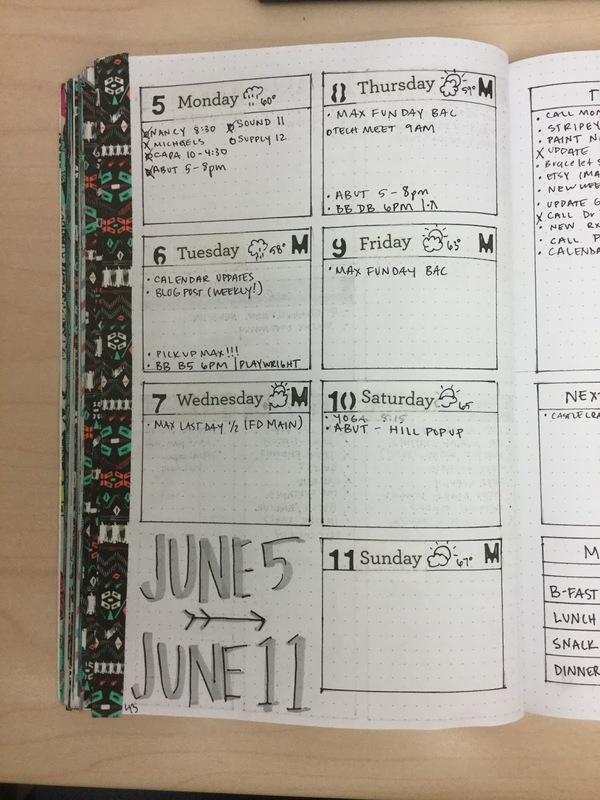 Last week was a 3 day weekend, and I had ample time to layout the month of June and create a fancy layout last week, they were super detailed. Unfortunately, I spent my weekend at work on Saturday for 10 hours and another 6 hours painting on Sunday, so I was really short on time. 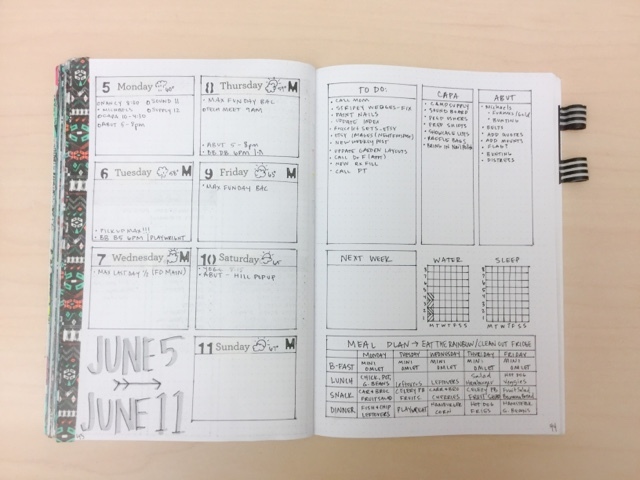 This week's layout is super simple. 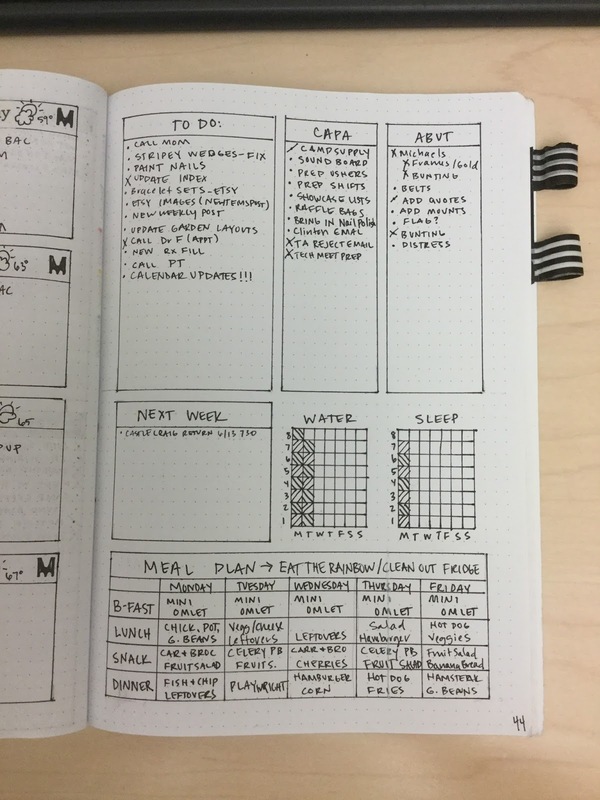 I've kept my daily tasks on the left, last week I found I was cramming a ton into that left page. 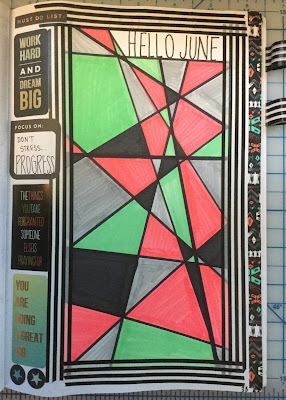 This week I separated out a few things, giving myself an area that was about the size of a 3"x 3" post it note to work with on my daily lists. So far it's been working out nicely. 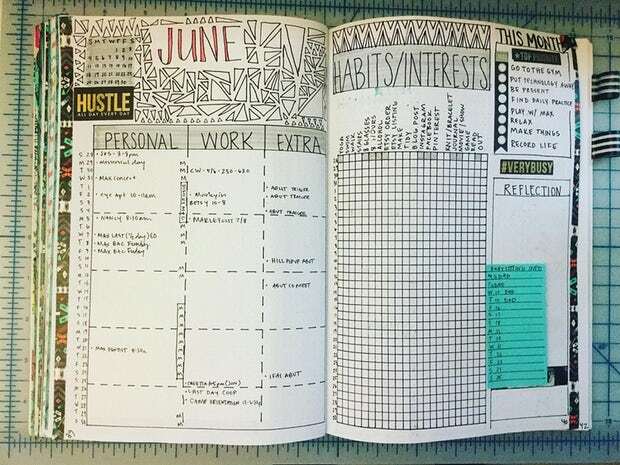 On the right I plan through my larger (non-day specific lists). 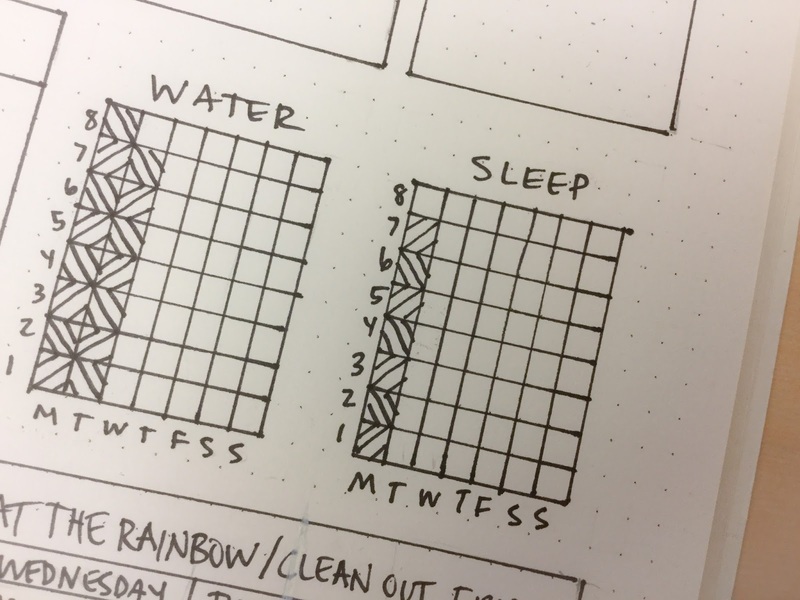 This week I separated out my water and sleep trackers (from my daily lists) this saved so much time! 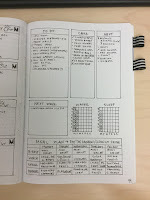 In last week's layout I had to break each day out for a tracker, which involved many more smaller lines/boxes. 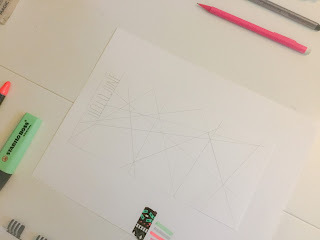 This week I just had 2 small grids to make and was fun! Also, I walked away from my color highlighters this week. Trying to keep things simple. I have been filling in my grids with lines with my handy dandy Straedtler 0.3 pen, which is my standard log pen. No need to carry around all of my markers, though I miss them, I've been far less concerned about tracking by color. Speaking of tracking by color. 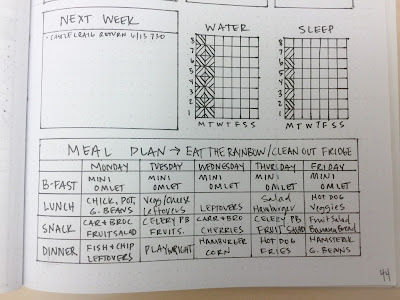 Last week I took a step away from my rainbow food tracking to a simple day plan. 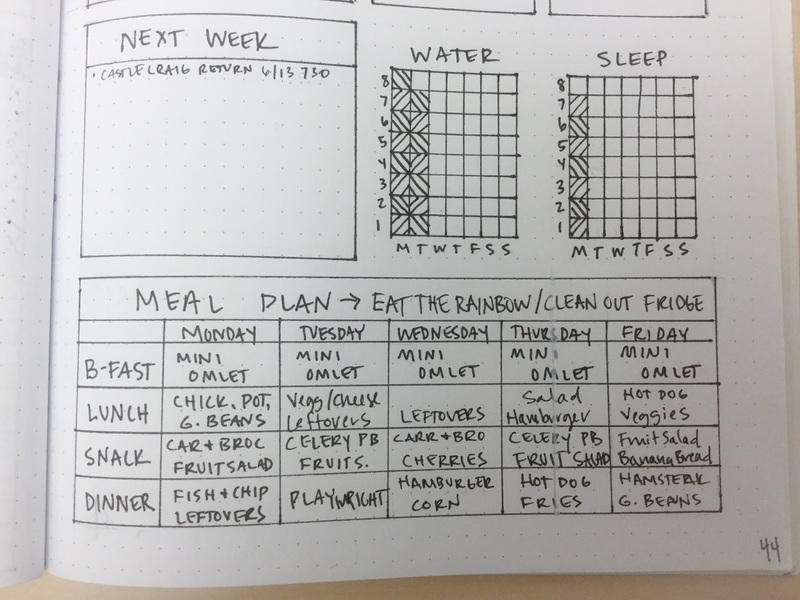 I took things a step further this week by planning out my whole meal plan (work days only). This has made mornings much simpler. At night while I'm tracking my notes/reflections/lists from the day I put my food together in the fridge based on meal plan I created and in the mornings I can just throw everything in my lunch box. The goal is to eat though the refrigerator and not my feelings. When I'm left to pick out food I will always go with what I want to eat instead of what I should eat. This week I've laid out a plan and so far I'm sticking to it, yes I know it's only Tuesday. So far, I have had enough food with me every day and if I take my feelings of the equation, I find that I can only eat what I have, and it's a much healthier option. Here's to making a plan and sticking to it. Making a plan is always easier to follow then making the plan, but I'm working on it. Thanks for checking out this week and see you soon! I have a bunch of new listings in the shop and hope to have another post about them coming soon!